(FinalCall.com) - Black fathers, faith-based organizations, national and local non-profits and various community entities held the first annual National Save Our Sons Night to encourage and facilitate fathers spending more quality time with their sons, and to present more positive media images of Black men and boys. According to National Save Our Sons Night creators, 111 organizations in 62 cities across the U.S. registered to participate and support the Feb. 6 event by coordinating activities for men and boys, many of them fathers and sons. 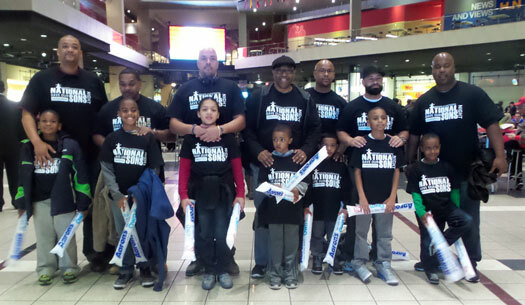 Fathers Incorporated (a non-profit which promotes responsible fatherhood and mentoring) was the driving force in spreading the word about events taking place around the country with Black boys and men, said Kenneth Braswell, executive director of Fathers Incorporated and founder of the National Save Our Sons Night campaign. “We were frustrated with the skewed imagery of our Black men and boys related to the unfortunate situations involving the police and others,” he told The Final Call. Although his organization agreed and supported many of the marches and protests, as an agency, it knew it needed to do something different, and “mobilizing people is something they’re good at,” he continued. Chris Broussard (ESPN commentator) and Fred Hammond (award-winning Gospel artist) serve as the campaign’s national spokespersons. Mr. Braswell said they are overwhelmed by the quick response, reaction and implementation of events all across the country, and it continues to receive pictures and emails from participants. With respect to feedback from mothers of sons particularly with no fathers in the home physically, Mr. Braswell noted two things. When they first began to promote the night, a woman asked on their conference call could women be involved. “It was ironic because I remember receiving the same kind of call almost 20 years ago as I planned the activities for the LOC (Local Organizing Committee) for the Million Man March. The answer today was as it was then: yes,” Mr. Braswell said. However, their focus is on activities that engage the relationship between fathers and sons, and proudly the campaign had women leaders all over the country that conducted events along those lines, he noted. “Secondly, I was not surprised that it would generate the “crying out” of single mothers struggling to find male role models for their sons or unsuccessful in engaging dad. We received many emails from both mothers and fathers seeking to find ways to strengthen the relationship with children. We are connecting them with resources and advice to find solutions,” he continued. He said Black boys face so many challenges and have so many problems; it’s an injustice to focus on just one or a few. With that acknowledgement, he highlighted why Fathers Incorporated works to combat the impact of fatherlessness in Black communities. Today, 73 percent of Black babies are born into out-of-wedlock households and while that doesn’t mean that they will grow up without interaction with their father, it does mean that at some point they will spend little to no time with them, he explained. “That’s heartbreaking, because fatherlessness can be found in almost every negative social ill that impacts our community,” Mr. Braswell added.